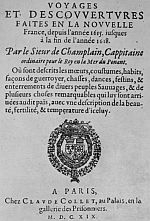 (HOST) As part of VPR’s special Champlain 400 programming, commentator Mike Martin is looking through the "Eyes of Champlain" all this week. Today, he considers Champlain and The French Connection. (MARTIN) In most of the United States, places are named for Washington or Lincoln, but in this region it’s all about Champlain. And not just the lake. There’s Champlain College, Champlain Transmission, Champlain Leather, and even Champlain Hypnosis – just to mention a few. Now, most of us know that Samuel de Champlain was a French explorer, and that this year is Lake Champlain’s Quadracentennial, but what’s the big deal? I mean, the lake isn’t just 400 years old, and Champlain wasn’t even the first person to discover it, only the first European. The lake is really around 20,000 years old, and the Abenaki were calling it Petonbowk, or "the waters between", well before Champlain named it for himself. So our celebration probably has more to do with people than geology, especially Champlain’s influence as the Father of New France, because while New France may no longer exist on any map, a quick look at my class lists reveals a Franco heritage that is still around today: my students have last names like Beaulieu, Pelletier, Charlebois, Rouelle, and Bonneau. In fact, it’s estimated that one in three Vermonters has French ancestry. And while our Québecois neighbors certainly remember New France – that’s why it says "Je me souviens" or "I remember" on their license plates – most of us on the Lake’s American shores think of ourselves as New Englanders. But by the time the English and Dutch made their way north to settle in our neck of the woods, the French had already been trading, trapping, and exploring in our region for some time. There were the voyageurs who covered vast expanses by canoe, trading and exploring as they went. There were the coureurs de bois, who did so too, but without the King’s permission, living amongst the indigenous peoples and largely adopting their way of life. And there were the robes noires, black-robed Jesuits who risked their lives to bring Christianity to the local tribes they encountered. If Champlain came back today, he’d still find traces of this legacy. Our region’s strong Catholic presence is due in large part to those French monks. Our outdoors enthusiasts, shooting the rapids and sleeping under the stars, echo the voyageurs, and our back-woods deer-jackers and prohibition rumrunners recall the coureurs de bois, those rascals who spent their lives on the fringes of the law, living off the land and traversing great forests. And don’t forget that our French forefathers learned from the Abenaki, who were successful farmers and hunters, and who saw themselves as stewards of the land here. Perhaps these ties between the Montagnais, Abenaki, Huron and the French make up Champlain’s most important contribution to our region. In 1633, he told the Montagnais, "One day our sons will marry your daughters and together we will form a single people." It’s this notion of tolerance and cultural blending, or métissage, that we should be honoring. We’re more than just New England Yankees around here. We need to remember we’re a little French and Native American too.